On the way home from work today, I decided to stop by the Anonymous protest to see what all the fuss was about. The group of hackers has made it their project this week to shut down San Francisco’s BART subway system in response to BART disrupting cell phone service to ward off an unrelated protest last week. Anonymous had already hacked into one of BART’s websites, and leaked more than 2000 user names and passwords, but today, they wanted to make their physical presence known. Besides disrupting commuters, Anonymous aimed to draw attention to BART’s behavior that supporters have compared to former Egyptian dictator Hosni Mubarak. To see for yourself, just check #muBARTek on Twitter. 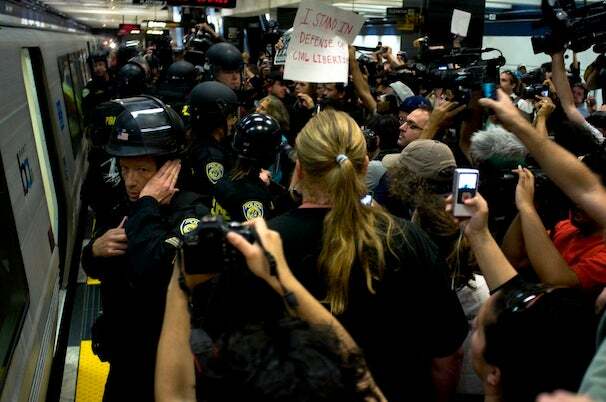 What I saw at the Civic Center BART station looked a lot more like a press conference than a protest. Photographers and writers seemed to outnumber actual protesters 2-to-1, and the protesters that showed up were being bombarded with reporters for interviews. After briefly stopping the BART trains while shouting "No justice, no peace," the protesters peacefully dispersed onto Market Street where they moved east towards San Francisco’s Ferry Building to continue the protest. At this point, I went home. But you can see full coverage of the protest at SFist.com. Updated 8/15/2011 11:32 PM PDT to correct a typographical error.